Home / Awareness / Incident / News / Viral / WATCH: This Boy Filled His Legs With Blood After Dipping It In The Ocean, Find Here Why! 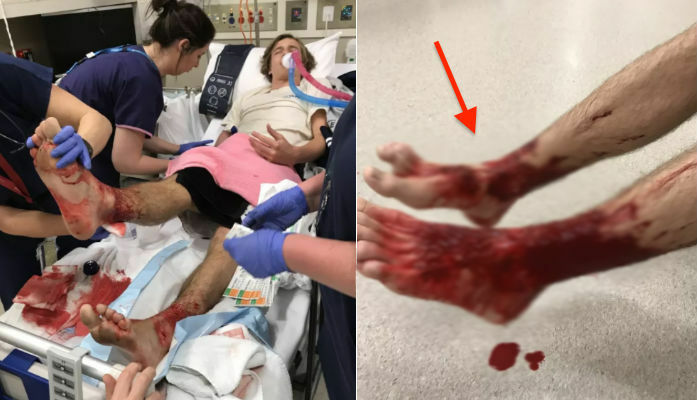 WATCH: This Boy Filled His Legs With Blood After Dipping It In The Ocean, Find Here Why! The temperature nowadays is extremely hot due to global warming. So everybody was thinking to go out of towns and had a quick escape to relax and unwind. When season like this, everyone is thinking the same thing “BEACH”. Who will not be mesmerized when you see a clear blue colored water of the ocean? For sure everyone would love to swim and explore the beautiful ocean to the fullest. After playing football, Sam Kaniyzay, a 16-year-old boy, an athlete, decided to swim to the ocean to lessen the heat of his body and freshen up. It was in Dendy Street Beach in Brighton, Melbourne. He enjoyed the freshness of the water, but suddenly felt strange about his legs. It became numb and something was pinching his feet. When he looked at it, his legs were covered by blood and immediately went out of the water. When he was home, he tried to wash his legs with water, but the blood continued to flow so his father, Jarrod brought him to the hospital. The doctors admitted Sam due to constant bleeding of his wounds. For almost 24 hours of observation, the wounds were getting worse and do not stop from bleeding so he stayed in the hospital for a couple of days. The father decided to went back to the beach to know what really happened to his son. He saw a raw steak and a net. From there, he concluded that his son’s legs were attacked by sea creatures called sea fleas. A marine scientist from the Museum Victoria named Dr. Genitor Walker-Smith examined the bugs brought by Jarrod and confirmed that those were sea fleas. The spokesperson of Victorian Department of Environment, Land, Water, and Planning said that “sea fleas were a common and natural part of a healthy marine ecosystem that keeps our marine waters clean by consuming dead and dying marine animals”. Did you find it creepy? Do you still swim into the ocean after reading Sam’s story? Let me hear from you, write your comments below.